The main question to us vendors was quite simple and challenging at the same time: why can’t manufacturers just make standards work in clinical practice? 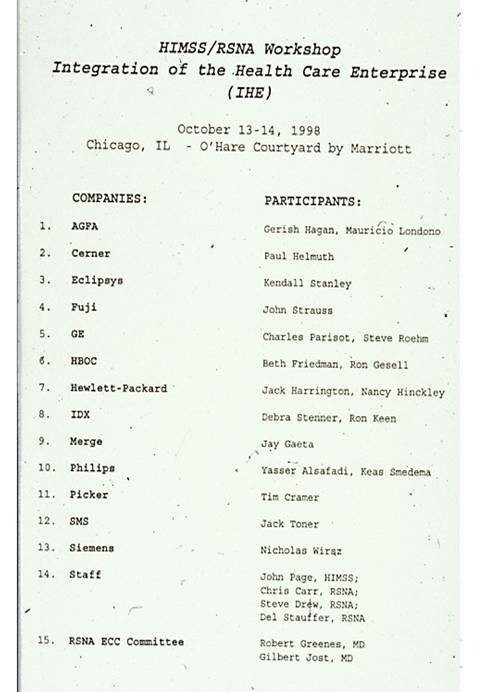 And after this first kick-off workshop – just one year later – it really happened, at first in Radiology by organizing a first multi-vendor Connectathon in North-America and an impressive demo at RSNA 1999 with 23 participating vendors bringing in 47 systems. This was the key success factor that made the IHE Initiative THE model for many other healthcare domains to follow. And there is no sign of stopping, not even after 20 years of continuous integration efforts. The IHE movement spans by now multiple continents, its frameworks cover multiple clinical domains, with significant contributions from user societies, vendor organizations, SDOs, universities and of course manufacturers implementing the IHE “meta-standard” in products with evidence of true interoperability documented in IHE Integration Statements. I am happy I had the chance to contribute to the establishment of the IHE Initiative and accompany the IHE pioneers for almost 15 years. I wish the IHE Community to continue to build upon its 20 successful years of growing interoperability and not lose momentum for the years / decades to come by embracing new technologies and remain at the forefront of cross-domain clinical integration.